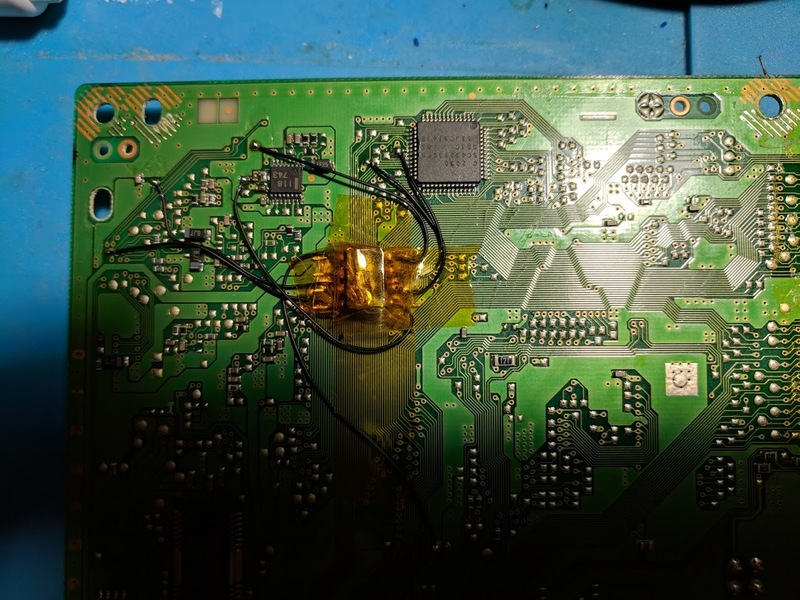 All of the points are fairly easy to solder to, with the only tricky point being pin one. Just don’t apply too much pressure or you might knock the capacitor off of the board. Placing the chip in between the circles for pins 3, 5, and 6 seems to be the ideal location. Flatten the legs of the chip so it can more easily fit underneath the board. Here are some installations I’ve done in some SCPH-5501’s. The first image shows a somewhat cleaner installation using alternate points for pins 1, 3, and 8. 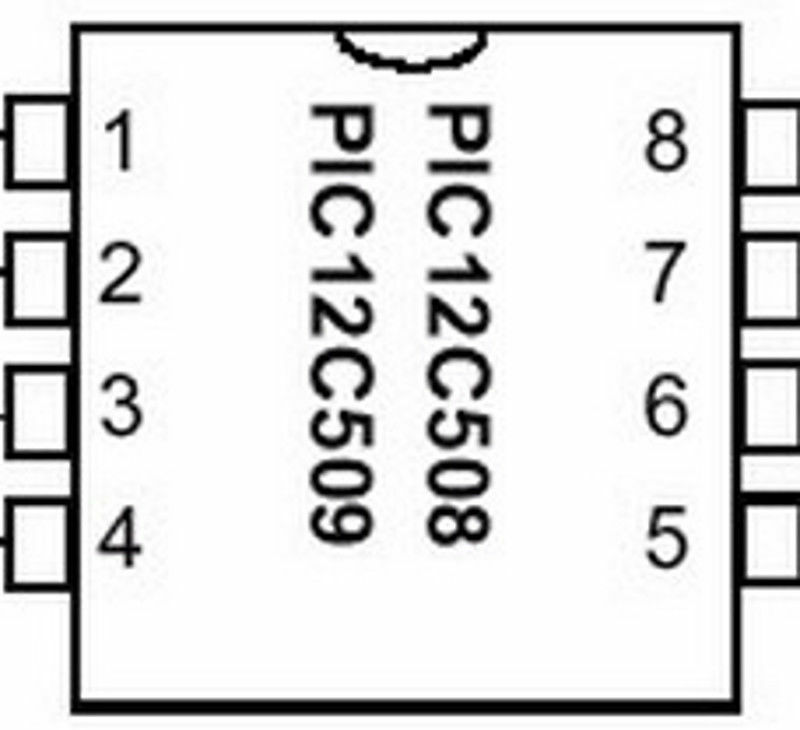 Chances are there are alternate points for 1 and 8 that are on the chip I soldered pin 3 to, which could result in an even cleaner installation. The image below shows a more standard installation using all of the points in the diagram. Completed my SCPH-5501 and now booting backups – what an adventure!!! Thanks to Williams for this page. So I don’t need to use pin 4? No. It is used to switch between modes of operation (like being able to disable the chip). This is an artifact of older non stealth chips that couldn’t play anti modchip games without the chip being disabled first. There’s something giving me problems with this board. The PS works without the chip but when I install the chip it won’t read disc. I’m having the problem with 3 different boards, any ideas? Could you send me a picture of what your installation looks like? Does it still read genuine discs? I had a couple bad MM3 chips. I got them working now! 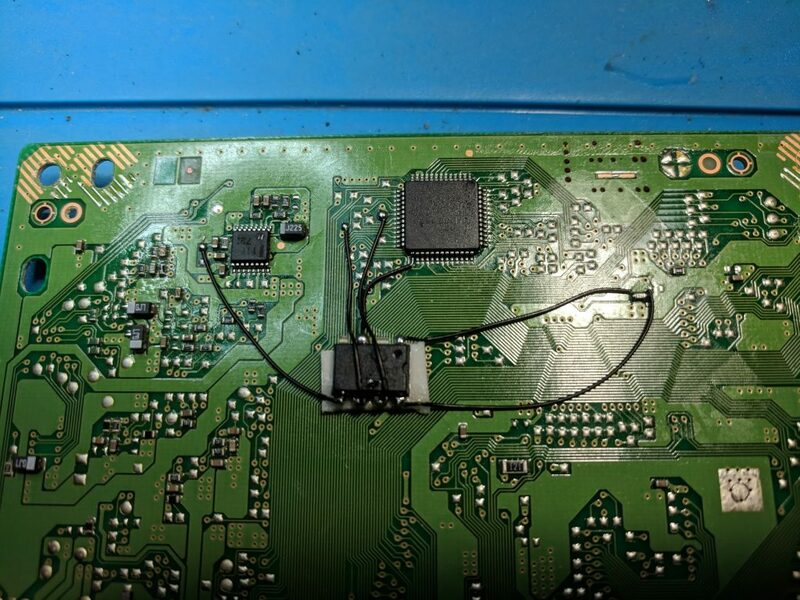 Did you try making sure all your wires are short and connecting pin 4? Thanks for the clear tutorial. I was able to get it to work with my 5501.
everywhere i look i see this 1st point labeled somewhere else with this contact point used as an alt. is there a reason your first contact point uses the alt point? Either point will work. Generally you want to use the one that’s closest to the chip. I really appreciate you hosting these instructions. It worked awesome for me!! That looks interesting. It is not an MM3 modchip. 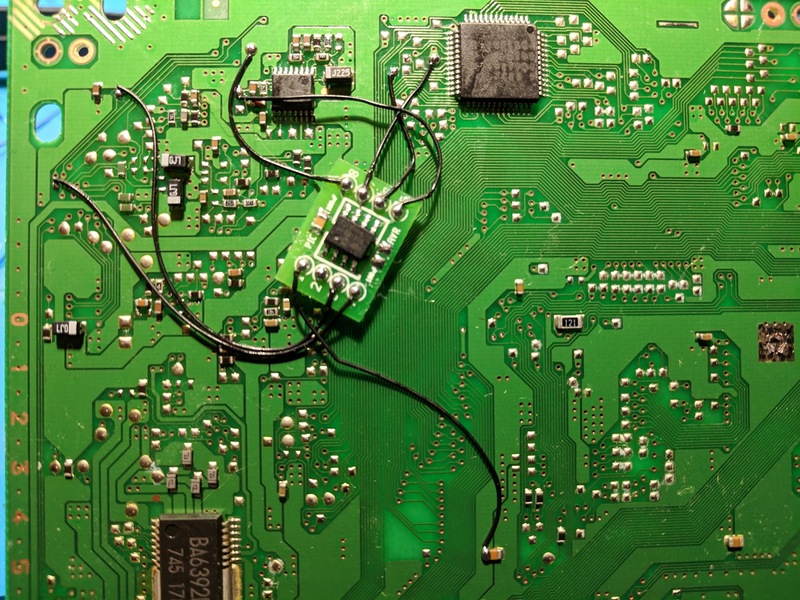 If you could use a multimeter to find out which pin on the chip connects to the red wire I might have a better idea of what it should be connecting to. You could also look around the board for spots that look soldered to. You might be better off removing the old chip and installing a new one.They usually aren’t installed very well (this one has really long wires, and the red one came loose), and might not support anti modchip games. Excuse my ignorance man, I’m fairly new to this sort of thing so I’m not really sure how I’d even find out where the wire came from using a multi meter. I could definitely have a go if you could tell me what to look for. 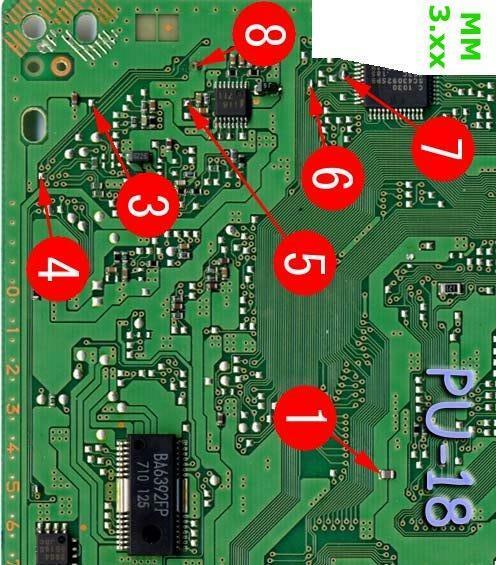 If you reckon it should be okay to just remove the existing chip without killing the board I’ll just go down that route and carry on with the MM3 as per the diagrams. Upon closer inspection it looks as though that red wire came from here (see pic). Yeah, it looks like something was soldered there. Hey man, I got around to installing my MM3 chip, turned on the console only to discover the picture is in black and white and very grainy which leads me to believe the chip that was already installed was some sort of patch to do with the video. The fact that the chip was on a board kind of makes it feel like it may have been a factory mod all along. what are your thoughts, is this fixable? Thanks. Is the color black and white for both PAL and NTSC games? Sorry my bad, the first three TV’s I tried were all NTSC and varied from b/w to only blue+green to no picture at all, and then I tried on our old tube PAL tv and it works fine, so there you go. Can’t get Burnt ROMS to boot though, so not sure if modchip issue or disc burning problem. Thanks for the guide! I just installed a PIC12F675, using a recompiled version of the PIC12F629 code (https://assemblergames.com/threads/ps1-mm3-for-12f683-12f675.53679/#post-873536). You say that pin 4 is not required, however to get it working I had to link that one in. After checking the source code of the firmware, pin 4 is indeed used in multiple parts of the code. With a tweak to the laser intensity, and Verbatim DataLifePlus media, it’s working flawlessly. It’s like 1997 again! i did my installation it worked, then after putting the case back on, im stuck on the white sony screen. took chip out still does the same, everything else that looks fine on the board, any ideas? Did you check around for any solder that may have splashed somewhere causing a short? i did, thank you for the reply my man. sorry to bother you honestly haha. but yeah everything is correctly in. and no solder around or “splash” on anything. if i killed the ps1 its my fault lol at least a new one is 15 bucks and ill at least have the chip. Maybe try checking some of the fuses on the board with a multimeter. They should have labels like “PS#” next to them. What programmer are you using? You’ll want to make sure the correct fuses are set, and that the internal oscillator calibration value isn’t being overwritten. Minipro Version 6.60, software came with my Minipro programmer that I typically use for PROM chips and it works well, first time programming a PIC but the software seems to support it as it has the option for the 12C508A. I also have a MPLAB ICD 4 but I haven’t used it yet. I’m not familiar with the fuse or calibration values should these have been provided by microchip as delivered? If so, maybe that is my problem and I overwrote them…Looking back at the program window it looks like two checkboxes are present for con.Fuse Bit and USER ID, I’m guessing if those are checked and your hex code doesn’t have values for them they get blanked “OFFF”? If so, could I just correct that and reprogram the chips? The Minipro programmers work. Post a screenshot of the config tab so I can see the fuses. These chips can only be programmed once, so you can’t reprogram them. From my experience with the Minipro programmer the .hex file loading will set the fuses correctly and just clicking program with all of the program screen checkboxes checked works. This isn’t the one installed but I did all ten chips the same, there doesn’t appear to be anything there. That configuration looks correct. Make sure your wires you soldered as as short as possible. Other than that let me know how your friend’s confirmed working CD works. I could probably make the wires a little shorter but they look fairly comparable to your lengths…maybe I messed up and lost track of pin one with the heat shrink…I’ll cut it open and take a look at that too. Just bought one of your programmed chips as well to try out. Update: Pins seem to be in the correct sequence after checking with the heat shrink removed. Yeah, the wire length is fine, and the wires are all going to the correct places. I did mine just like the instructions say and used one of the pictures for comparison…now my discs won’t spin. ..
1. A short somewhere on the board. 2. Soldering to the wrong points on the board. 3. Wires that are way too long. 4. A broken or improperly inserted disc drive cable.